There is nothing like a homemade broth. Store bought simply can't compare. It is richer and more flavorful and adds lip-smacking goodness to soups, sauces and gravies. You know when you have a big pot of homemade soup on the stove, it's comforting and a nourishing meal for your family. 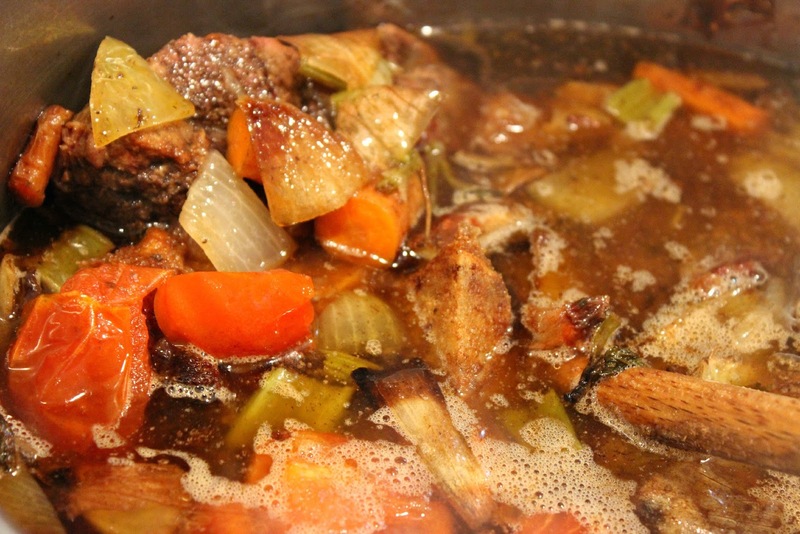 Bone broth is typically made with bones and contain a small amount of meat adhering to the bones. 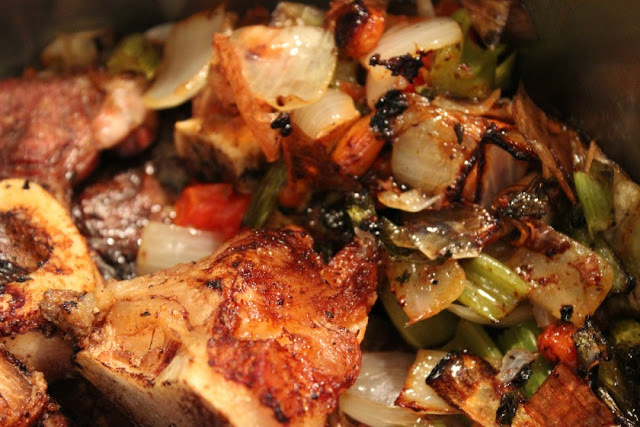 Bones are roasted first to improve the flavor of the broth. Bone broths are rich in protein, minerals and rich in gelatin which may support skin health. Gelatin also supports digestive health. Bone broths are also inexpensive to make. Using the bones from leftover roast chicken or turkey with some veggies, you can make quarts of stock for pennies! If you have a pressure cooker, you can cut the cooking time in half. 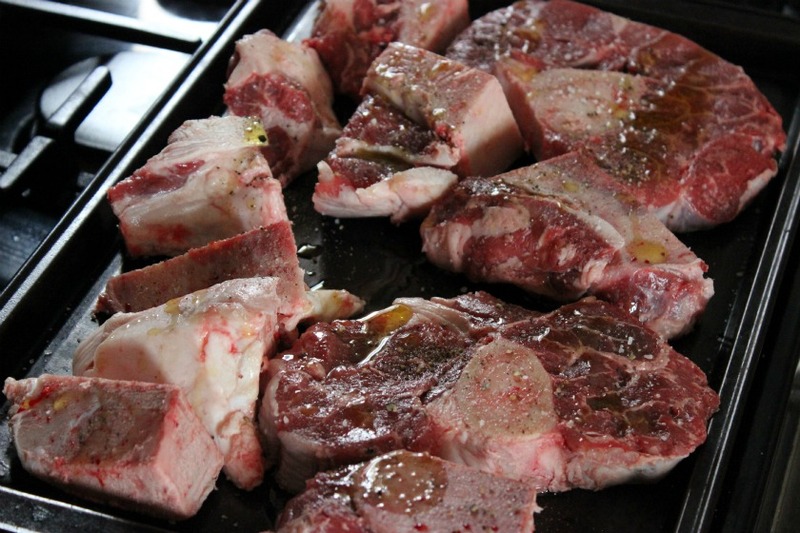 Preheat oven to 450 degrees F. Drizzle bones with extra virgin olive oil and sprinkle with salt and pepper. Roast for 30 minutes, turning halfway through cooking time. Cut carrots, celery and onion roughly into 3" pieces. Add to pan along with the garlic cloves. Roast an additional 30 minutes, turning halfway through cooking time or until bones and veggies and browned and caramelized. At this point, your kitchen smells like you are roasting a Prime Rib Roast! Transfer to a large stock pot and add cold water to cover (about 3 quarts). Add 1/2 cup water and scrape up browned bit from roasting pan - Get every bit! Add liquid to pot. Add parsley, bay leaf and peppercorns. Bring to a boil, reduce heat and simmer 3-4 hours, skimming foam and fat from surface and add additional water if needed to keep bones covered. Strain and cool. Can be made 2 days ahead or frozen for 3 months. Makes 3 qts.